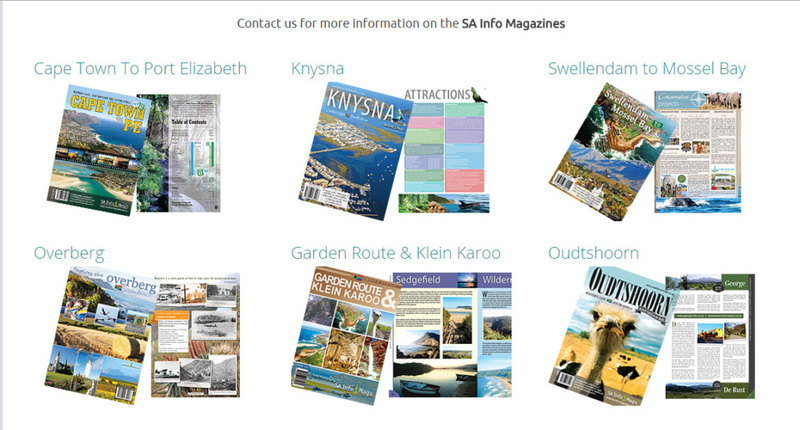 SA Info Magazines owned and managed by Integrated Marketing creates, designs and publishes a range of tourist information magazines which are sold at various retailers across the Cape region. The publications are A4 glossy magazines and cover a broad spectrum of material aimed at providing information to visitors touring the various areas. The magazines are filled with useful information on the relevant towns and surrounding areas, along with fantastic photos showcasing each regions uniqueness. There are maps as well as information on activities, accommodation, restaurants and businesses – all the necessary information for tourists to be informed and to enjoy their holiday. DVDs are sold with the magazines offering great photography, advertising and aerial footage of the areas covered within each magazine. The magazines are also available online via Ezine. The magazines are sold at various retailers and tourist venues across South Africa, providing not only the information but are ideal collector items. The magazines provide fantastic advertising opportunities for those that would like their businesses and establishments to have a greater marketing edge. Clients who advertise within the SA Info Magazines are given the opportunity to market themselves on a range of marketing websites owned and managed by Integrated Marketing. This opportunity is included in the Info Magazine marketing package. Advertising in the magazine runs for a full year (February 2016 – January 2017) and gives advertisers the opportunity to market themselves in print, digitally and on DVD. The SA Info Magazine range is very well received and can be found in hotels, Bed and Breakfasts, curio stores, book stores, filling stations etc. For more information on the publications visit our website : www.sa-info-magazines.co.za. Contact us for more information on advertising opportunities.